Despite its controversy, liver biopsy is the gold standard for diagnosis of alcoholic hepatitis. The evaluation and diagnosis of alcoholic hepatitis, as with any other medical condition, require careful history and physical examination. Laboratory assays will, of course, aid in its confirmation. Nevertheless, there may be uncertainty because the clinical and laboratory findings overlap with other diseases [1, 2]. This consideration, and others, lead to recommendation for the use of liver biopsy in these clients. 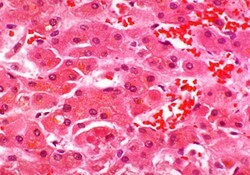 Specifically, the most accurate way to confirm the presence of alcoholic hepatitis is histologic view of liver tissue. When the clinical presentation strongly suggests severity of this condition and there are plans for medical therapy, the use of liver biopsy is, in essence, a necessity [1, 2]. Liver biopsy is especially desirable when there is lack of clarity about the diagnosis. This may occur when the patient cannot provide an adequate history about intake of alcohol. Examples will include alcohol withdrawal or hepatic encephalopathy which, of course, will cause the client to have mental confusion [1, 2]. Aside from the diagnosis, other advantages of liver biopsy include information about the stage of disease and how well the patient will do in the long run . Transjugular liver biopsy may not be available in many communities as tertiary medical centers are generally the only facilities which perform that procedure. It is quite safe, and there are not many instances of complications such as bleeding or death [1, 2]. These safety issues can make transjugular liver biopsy preferable to the percutaneous approach. In other words, the occurrence of low platelet count, ascites, and bleeding disorders will place the patient at risk for complications from percutaneous liver biopsy [1, 2]. The physician must, at the same time, remember that liver biopsy alone does not always provide pathognomonic evidence of alcoholic hepatitis, liver cirrhosis, or other medical conditions. The reason is that microscopic findings of these diseases commonly occur in many illnesses, and clinical and laboratory results will still be necessary to make the diagnosis regardless of whether the client has a liver biopsy [1, 2]. In alcoholic hepatitis, the liver biopsy may show steatosis, hepatocyte injury, and infiltration of white blood cells. There may be Mallory bodies or intraparenchymal cholestasis. However, these same observations may be present in a patient with non-alcoholic steatohepatitis as well. Hence, the occurrence of liver failure, whether acute or chronic, may be the result of alcoholic liver disease, or it may occur from a condition in which there is not any excessive intake of alcohol [1, 2]. In fact, the most common cause of acute liver failure in the United States is overdose of the analgesic acetaminophen . There has been much progress in the diagnosis and management of alcoholic hepatitis, and clinicians must conduct a thorough evaluation of these patients in order to afford the best outcome. Dhanda, A., Collins, P., and McCune, C. (2013). Is liver biopsy necessary in the management of alcoholic hepatitis? World Journal of Gastroenterology, 19, 7825-7829. Dugum, M., Zein, N., McCullough, A., et al. (2015). Alcoholic hepatitis: Challenges in diagnosis and management. Cleveland Clinic Journal of Medicine, 82, 226-236. National Institute of Diabetes and Digestive and Kidney Diseases. (2010). Liver transplantation. Retrieved April 30, 2015. The photo shows a microscopic view of human liver and Mallory bodies, which are present in some patients who have alcoholic hepatitis.